An Amazing Week in the Foodie Capital of Italy and Venice! 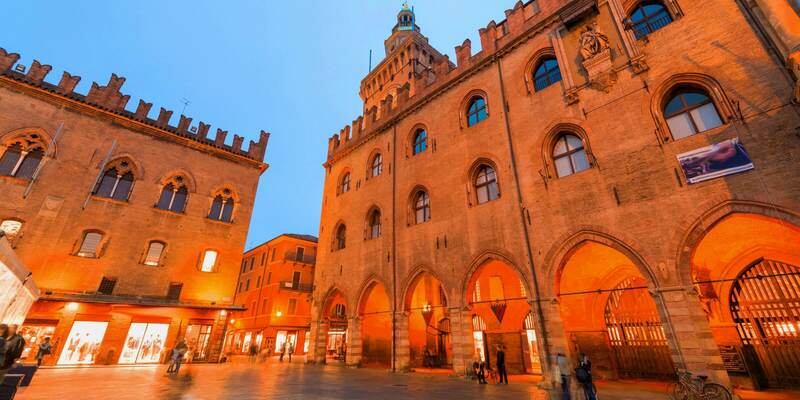 Discover the Culinary Treasures of Bologna, Modena, Parmesan Cheese, Prosciutto & Mortadella! Experience the Beauty of Italy's Most Iconic Sports Cars! This 8-Day, 7-Night, All-Inclusive vacation will consist of a very small and intimate group of about 16 or fewer people. Our guests stay the week at a luxury, boutique hotel in the city center of Bologna. This week is all about having incredibly unique cultural experiences that will give you memories to last a lifetime. 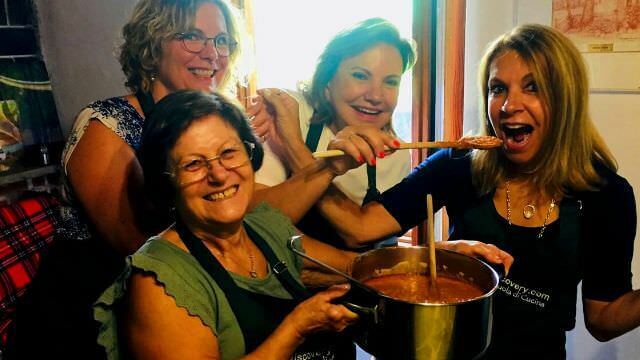 You will live the Italian life as we cook authentic Bolognese recipes together with the real chefs of Italy - The Italian Nonna's (Grandmothers) and also a Michelin Star Chef in his professional kitchen. 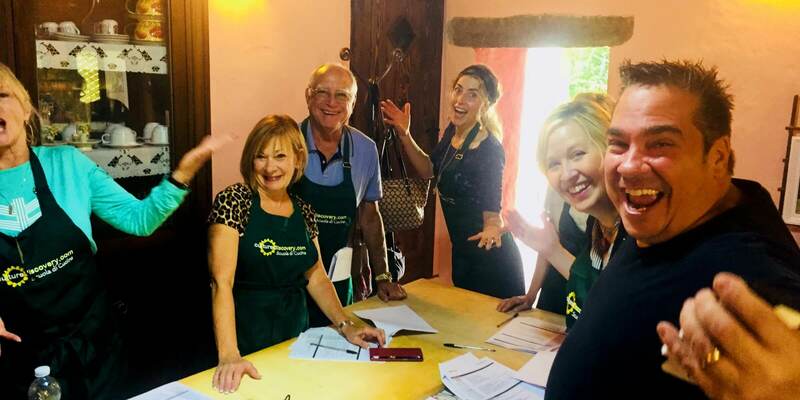 We'll be having four cooking classes this week as we interact with and befriend the locals, get to know small-village artisans, and so much more - Including the Ferrari Museum and Lamborghini Factory! This trip will make you pinch yourself over and over in amazement that you are actually living it. Most of all, it is a week of fun, family and laughter as we share what makes Northern Italy so special in a very personal way. OK, so B-O-L-O-G-N-A draws up Baloney, and that is not the image we want to portray. Let's try again... Mortadella! 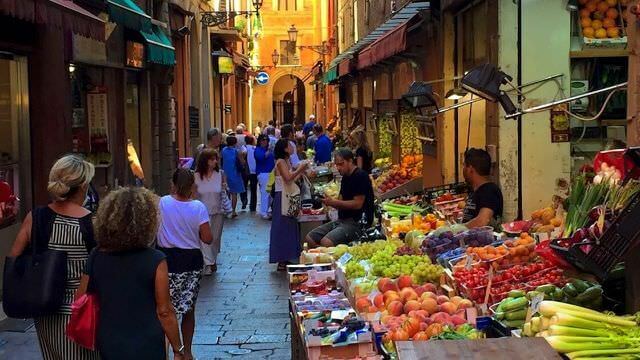 Bologna is one of Italy's most iconic cities for food, art, and architecture, yet it is not often visited by mass tourism. It is home to the world's oldest university, the tallest tower in Italy, and it is the birthplace of Bolognese Sauce - shall we call it Ragu? Sauce? Gravy? Whatever you call it, it originated here, and not a single Italian will tell you it can be better anywhere else. 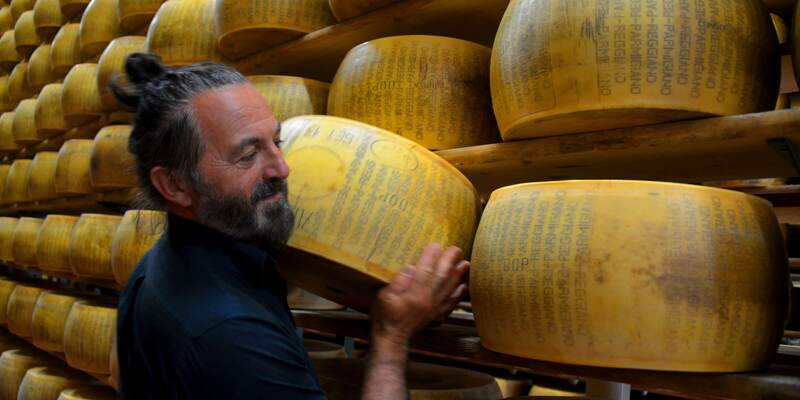 It is the birthplace of Tortellini, Tagliatelle, Ravioli, Lasagne Verde and its surrounding area exclusively produces Parmigiano Reggiano cheese, Parma Prosciutto, Traditional Balsamic Vinegar of Modena, and the "Motor Valley", home to Ferrari and Lamborghini, Maserati, Ducati and more! 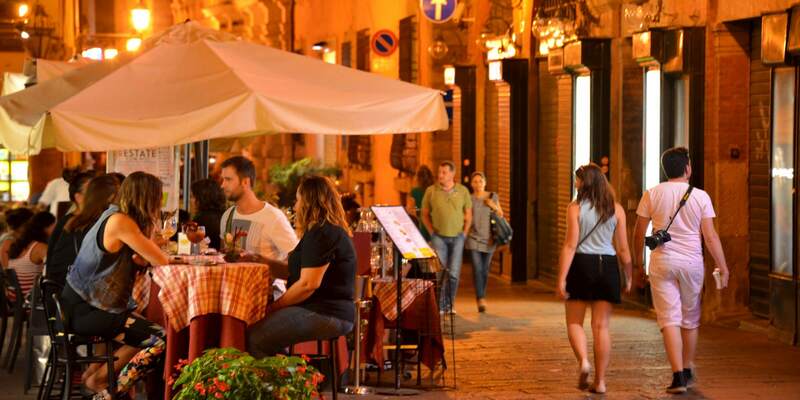 Bologna is considered a major food capital in Italy... for Italians! It boasts a rich and diverse culinary history. It goes far beyond its namesake pasta sauce and Mortadella. Ask any Italian what the most important thing to do in Bologna is, and they will all say...MANGIA! MANGIA! We chose Bologna as our seventh location for more than just the food. 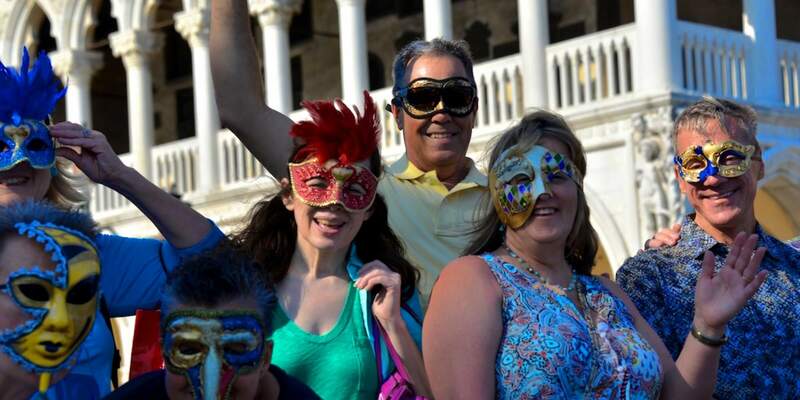 It also happens to be strategically located in an area that allows us to get to some of Italy's most recognizable names for our daily outings. We'll take the high speed rail from Bologna directly to Venice for a full day beginning with something that the tourists don't get a chance to see - A private visit with an artisan Gondola maker. 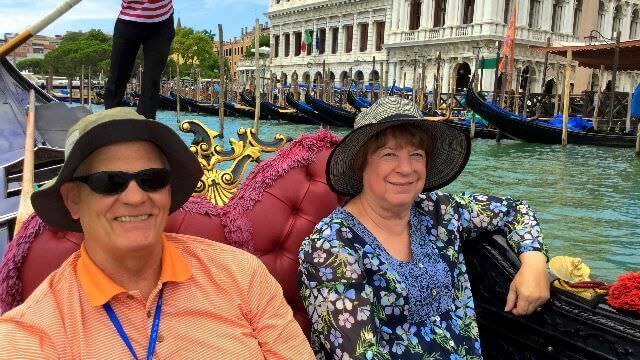 After which, we'll take a private gondola ride directly to St. Mark's Square! We'll visit the cities of Parma, Modena, the countryside of Reggio Emilia, and the hillsides around Bologna. 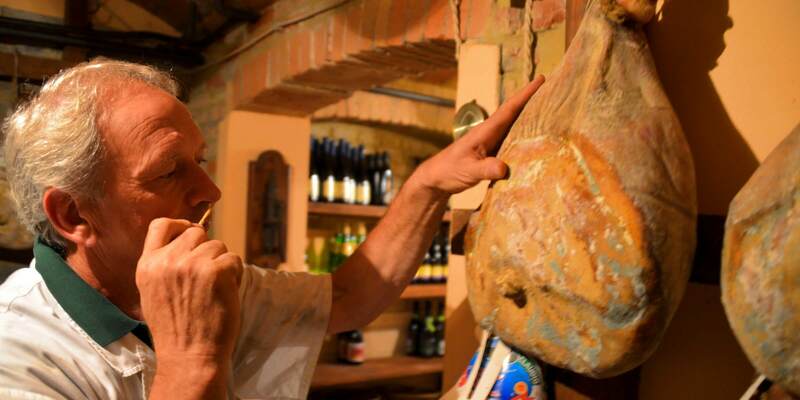 We'll visit with a small, family-run traditional Balsamic Vinegar producer in Modena, a Parmigiano Reggiano cheese producer (where we will milk their cows), and even a small Parma Prosciutto producer that ages our own prosciutto in his private cellar! And as mentioned above, we're in the "Motor Valley", home of Ferrari, Lamborghini, Maserati and Ducati Motorcycles! On our day in Modena, after our guided city tour and shopping in the central market, we'll head to Maranello for a guided tour of the Ferrari Museum. 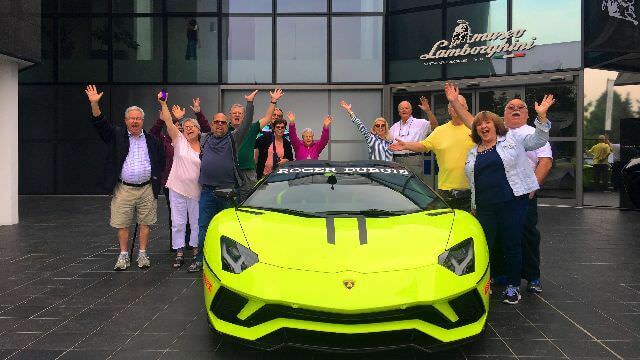 On yet another day, we have an incredible, behind-the-scenes guided tour of the Lamborghini Factory, where we will walk the assembly-line and see exactly how these luxury sports cars are built from the beginning to end. We would love to show photos of all this, however it is strictly a "no photos" zone! Wine in this area? Absolutely! 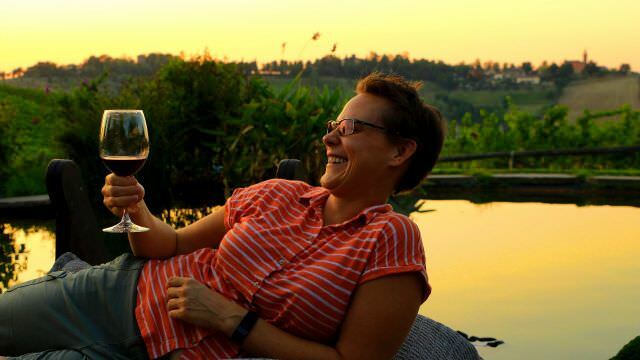 While Tuscan wines like Chianti, Brunello and Vino Nobile get the most international press and publicity, each region of Italy is known for certain wines. The area of Emilia Romagna is known for its Lambrusco, Cabernet and Sangiovese-based wines. We will be trying lots of them this week with our meals, during cooking classes and, well, sometimes for no reason at all! 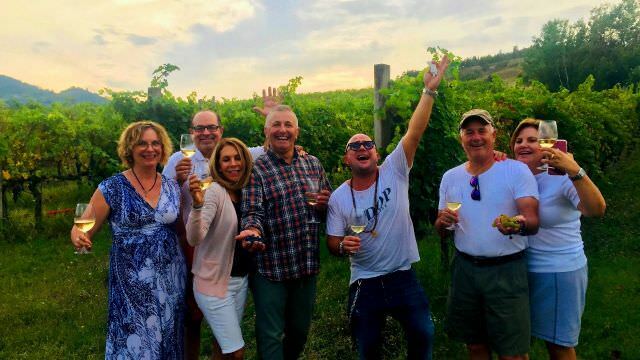 To take it a step further, during one afternoon and evening, we will be going into the rolling hills near Bologna for an Italian-style BBQ party at a local, family-run winery! This week we have four cooking classes, designed to give our guests a rich experience with local cooking. Two of our classes will be with two local women, Pina and Bruna, who will teach us traditional recipes at a private country home. Another class, will be at the Michelin starred Ca' Matilde restaurant, and will be taught by their master chef, Andrea Incerti Vezzani. Our final class will be all about local pasta made from scratch, and will be held at a private home in the Bologna city center. We'll have our home-made pasta as part of our farewell dinner! As we'll be staying in the City Center of Bologna, we will also venture out to other local destinations. 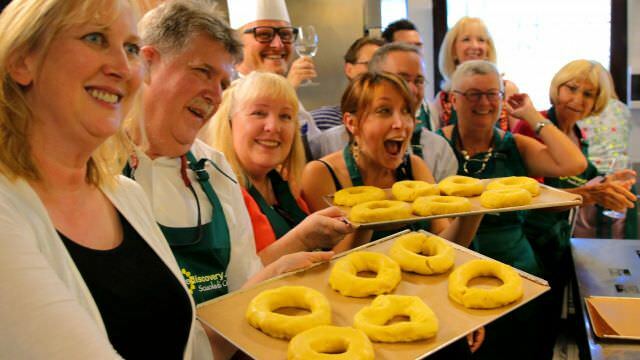 Two of our cooking classes will take us just outside the city to the small town of Pianoro. We'll also be guests at a family run vineyard in the rolling hills of the Colle Bolognese, and more specifically, the area of Savigno. 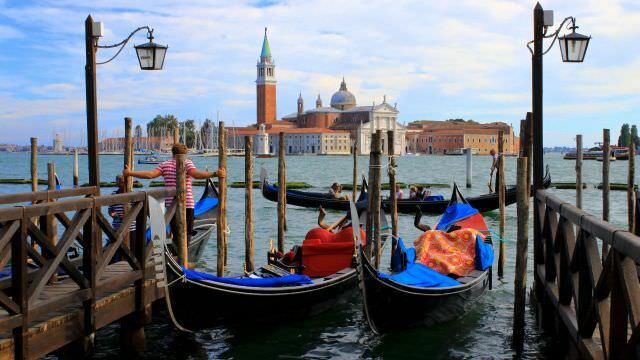 We'll be traveling First-Class by train to one of the most amazing cities in the world, Venice. Known for its canals, gondolas and maze of streets and bridges, we'll have an insider's look as we visit a local artisan gondola builder or Squero as the are called. 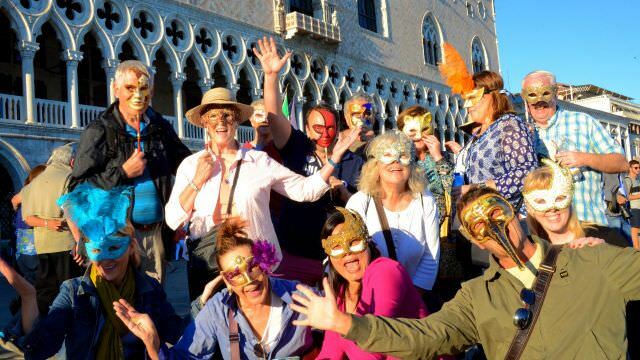 Take some time after our lunch to stroll the area near St. Mark's Cathedral and the Doge's Palace. Some other fascinating places we'll be going to are, Modena, with its central market and gorgeous piazzas. We have an amazing lunch experience with the family of a small- production Balsamic Vinegar maker. 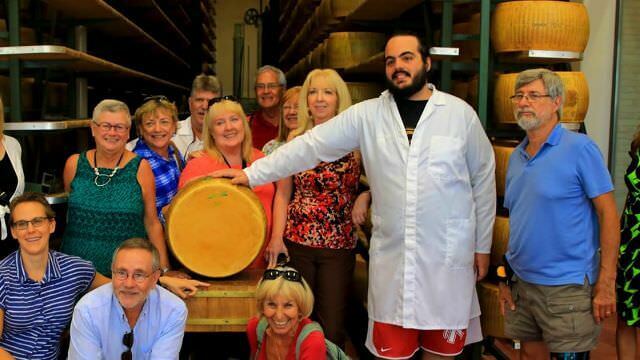 Also, Reggio Emilia where we have a personal visit and hands-on experience with an authentic and small-production Parmigiano Reggiano Cheese maker. We'll head to Maranello for a guided visit the Ferrari Museum. And on another day, we'll be in the area of Sant'Agata Bolognese for our guided tour of the Lamborghini Factory. We'll also spend a lovely morning strolling one of the most beautiful cities of the area, and also the home of the world-famous prosciutto, in Parma. 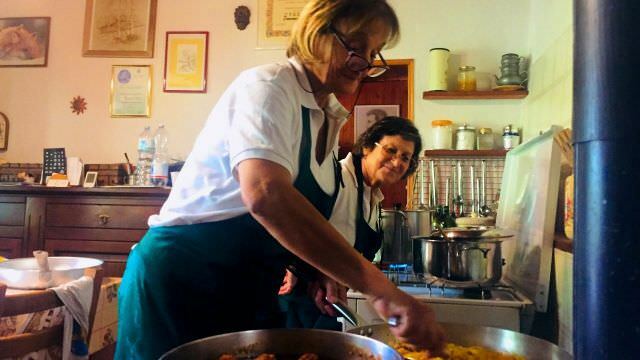 Your first class is with Pina and Bruna at the private country home of Bruna's daughter, Silvia, and features some of the areas most iconic dishes. Today's class takes place at a Michelin Star restaurant in the countryside of Reggio Emilia. We'll be taking over the kitchen of Ca' Matilde. The chef and owner, Andre Incerti Vezzani, will be our class instructor and teach us some of the finer points and techniques used in the local cooking. For today's class, we're back at Silvia's home where we'll be making more traditional Bolognese cuisine. 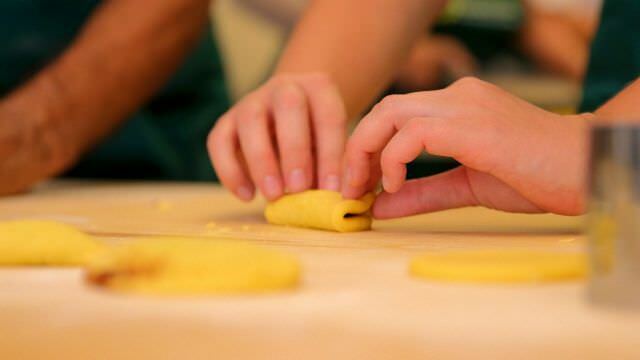 Class #4: Tortellini and Pasta Class! For our final class, we're making local specialty pastas! 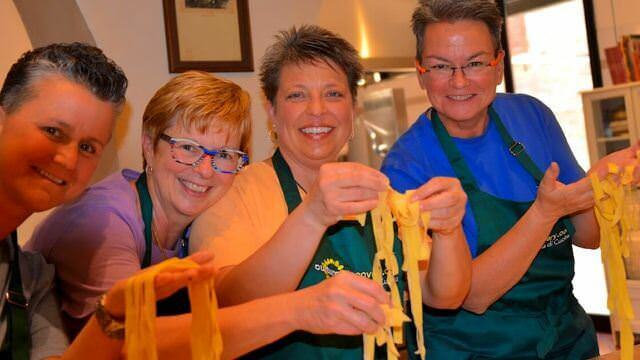 We are guests at a private home in the center of Bologna where we will be taught the fine intricacies of making some of the local pastas like, Tortellini.